Big Picture education Australia has launched a set of classroom posters about key Big Picture concepts. 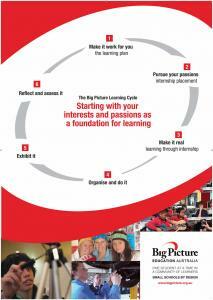 The posters are designed to help you to enthuse mentors, parents and prospective students about Big Picture. And, these are the first of many. The Big Picture Learning Cycle concept poster is designed to be read by students and visitors and to cause reflection as well as trigger discussion. The ‘One Student At a Time’ concept is central to Big Picture practice. This poster is a reminder of the big idea. Learning Through Internship’ is another core Big Picture concept. This poster sets out why. from other designs of schooling. The distinguishers inuence everything that leaders, advisory teachers, students and families try to do in school. The posters are available NOW. Click the the add to cart button to order.